Handmade in Wonky HQ! !These herb pouches are handcrafted using specific herbs for each individual purpose and finished off with a charm. Created with magick. 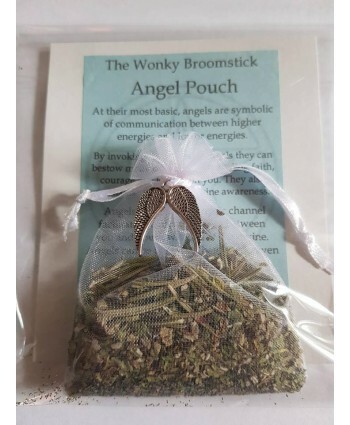 These pouches are for you to carry with you or place on your altar.By invoking the power of Angels they can bestow many of their gifts including faith, courage and love upon you. They also symbolise purity and divine awareness.This handcrafte.. Handmade in Wonky HQ! !These herb pouches are handcrafted using specific herbs for each individual purpose and finished off with a charm. Created with magick. These pouches are for you to carry with you or place on your altar. 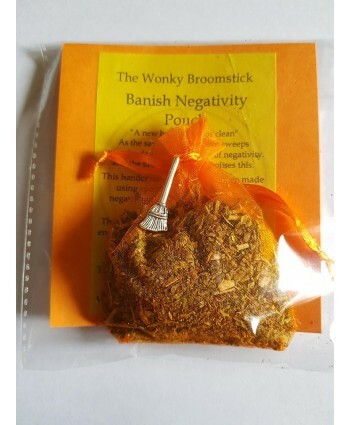 "A new broom sweeps clean"As the saying suggests the broom sweeps away negativity and this is why we have this gorgeous broom charm on this pouch.This handcrafted herb mix has.. Handmade in Wonky HQ! !These herb pouches are handcrafted using specific herbs for each individual purpose and finished off with a charm. Created with magick. 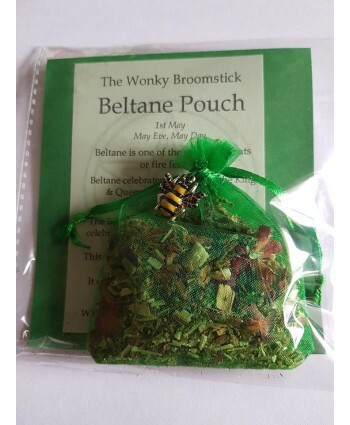 These pouches are for you to carry with you or place on your altar.Beltane - 1st MayBeltane is one of the greater Sabbats or fire festivals. Beltane celebrates union of the King and Queen May and people dance around the Maypole.The Bee c.. Handmade in Wonky HQ! !These herb pouches are handcrafted using specific herbs for each individual purpose and finished off with a charm. Created with magick. 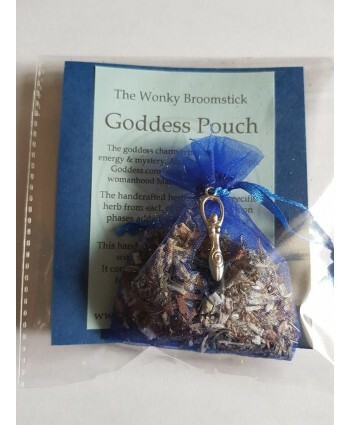 These pouches are for you to carry with you or place on your altar.The goddess charm represents feminine energy and mystery. Also known as the Triple goddess consisting of the 3 phases of womanhood Maiden, Mother & Crone.The handcrafted h.. Handmade in Wonky HQ! !These herb pouches are handcrafted using specific herbs for each individual purpose and finished off with a charm. Created with magick. 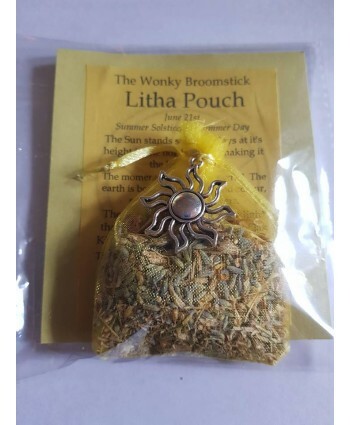 These pouches are for you to carry with you or place on your altar.Litha/Summer Solstice - 21st June The sun stands still for 3 days at its height in the northern sky making it the longest day. The Sun charm represents the ligh.. Handmade in Wonky HQ! !These herb pouches are handcrafted using specific herbs for each individual purpose and finished off with a charm. Created with magick. 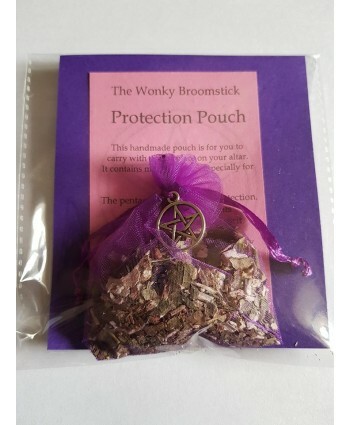 These pouches are for you to carry with you or place on your altar.This protection pouch contains magickal herbs especially for protection.The pentagram symbolises protection hence why the charm is on this pouch. It also represent the el..